Another mine collapsed in Turkey on May 14, Turkish Haber7 TV channel reported. The mine is located in the Zonguldak Province. Reportedly at least one worker was caught under the rubble. Rescuers have arrived at the accident site, and six miner were rescued from the collapsed mine, Haber7 said. In total there are 740 coal mines and 48,706 miners in Turkey. Over 3,000 people have been killed and over 100,000 have received various injuries since 1941 to the present day in the mine accidents in Turkey. Some 10.4 percent of the total number of the work accidents occurs at mines in Turkey. In the first four months of 2014, some 1,235 people were killed as a result of the work accidents in Turkey, 103 of them were female. The worst mine accident in Turkey's history occurred in the province of Zonguldak in 1992, killing 263 workers. 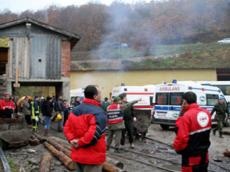 January 8, 2013: mine explosion in Zonguldak - eight dead.